FLIR is one of the most popular names of a company that is into the business with thermal imagers, although up until recently they were focused more on the professional side of things. Lately however the company is also seeing the big market potential that affordable consumer level thermal cameras in the form of accessories for mobile devices open up. 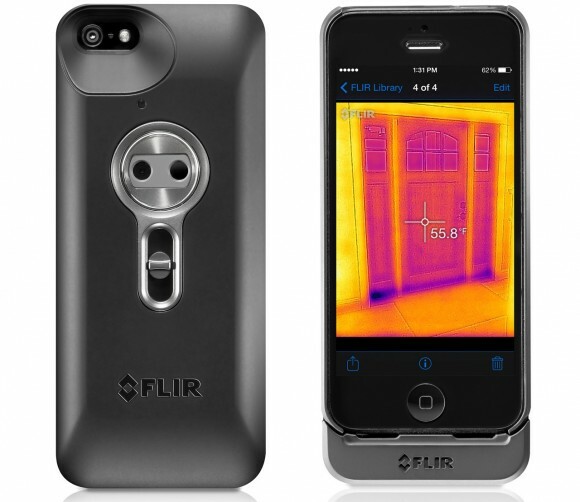 The result is the FLIR ONE thermal imaging accessory designed especially for owners of Apple’s iPhone 5 and iPhone 5S smartphones. We are talking about thermal imaging accessory and not just for a thermal camera as the FLIR ONE comes with two cameras, one for visual light and one for thermography. FLIR has decided not to go using the built-in visual light camera into the iPhone 5/5S which is much better than the one they have included, but maybe their choice was based on design limitation or who knows. You should be aware of the fact that FLIR ONE comes in the form of a case for the iPhone 5/5S using the Apple Lightning interface and is not compatible with other iOS-based devices. While this design idea is fine if you own an iPhone 5 or 5S, but Apple has already released iPhone 6, so if you want to be able to continue using the FLIR ONE you would need to have a spare iPhone 5 or 5S even if you go and buy the new iPhone model. We have already mentioned the fact that FLIR ONE comes with two cameras, one for visible light images and one thermal camera. FLIR uses the image data from both devices blending both images using MSX Technology and thus providing physical detail to the raw thermal reading. Normally thermal images do not reveal a lot of detail of the physical objects that you are checking as they contain thermal information, but when you take a visible light image as well and take the outlines of objects from it and blend that data with the thermal image the results are great. Even with lower resolution thermal image this method makes it possible to get a much better looking thermal images that are easier to read and understand, especially from people that are not too experienced with thermal imaging. The FLIR ONE thermal imaging accessory is based on the small and affordable Lepton micro thermal imager. This small sensor is what makes possible to have a lower resolution FLIR thermal cameras available at very affordable prices. Even though the available 80×60 pixels thermal array from the Lepton sensor is not too much it is still quite useable, especially when you blend the thermal image with a visual one to provide more visual details to the user. It is interesting to note that when displaying real-time images or recording video, FLIR ONE employs an image enhancement that produces a 160×120 thermal image according to the manufacturer of the device. The FLIR ONE accessory for iPhone 5/5S is available at a price of $349.99 USD and we have already ordered one to use as a part fo our testing equipment, so soon you will be able to see actual thermal images as well as read our personal feedback from using the device. The only thing that we are not overly happy in the specifications of the device is the temperature range that it operates in, it would’ve been much better if it was a little bit wider than what it is. Other than that we hope to be satisfied with what FLIR ONE will provide us with in terms of resulting thermal images, though we are also looking at other alternatives as well as FLIR is already facing a bit of competition in the field of affordable consumer oriented thermal cameras. There are alternatives that are supposed to offer better specifications at least on paper, but FLIR has the advantage of years of expertise in thermal imaging. The Seek thermal camera is another affordable accessory designed to bring thermal imaging to mobile devices such as smartphones. 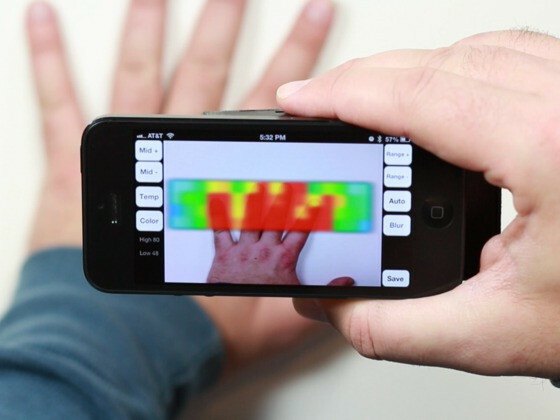 The Seek thermal camera has two versions – one of Android-based smartphones equipped with micro USB and a different one designed for Apple smartphones or other iOS-based devices that use the newer Apple Lightning connector. The device is already available and is shipping to customers, though for the moment only the Android version is on sale and shipped as apparently the Apple model needs to go through some more approval from Apple to be sold as an official accessory. You can already order the Android-based Seek thermal camera for $199 USD, though it is only being shipped to customers in USA and Canada for the moment. Other than the difference in the interface and the device the two camera models offer essentially the same specifications and these are actually quite attractive for the price you are asked to pay for the thermal camera module. We are already waiting to see the release of the Apple model of the camera and the company to start shipping to Europe as well in order to be able to get one of these Seek Thermal Camera accessories to try it out. We have already mentioned that the price is really good for what specifications the device seems to offer and if the hardware is well matched with good software functionality, then this could be a great product to get and use as your first thermal camera. It seems that we have reached a time when users are willing to have more and more functionality available for their smartphones, so it is no wonder that we are seeing more and more interesting accessories. That trend could not pass thermal imaging as well, though since the sensors that are used in thermal cameras are still quite expensive some compromise may be required to make a thermal imaging accessory affordable enough. IR-Blue is one such device and it is even an open source project – an affordable thermal imaging accessory compatible with both iPhone and Android smartphone and tablet devices that can increase the functionality of your mobile device. IR-Blue uses a 64 zone non-contact InfraRed sensor array to read the temperature of what you are viewing and the device connects using Bluetooth to your iPhone or Android device to show the temperature readings as colors on the screen. The only drawback that the IR-Blue has is that the sensor it uses is very low resolution as compared to what even the more affordable thermal cameras do come equipped with, but still when you overlay the thermal information on top of actual image of the same object in the visible light spectrum the results can be quite interesting and useful. The 64 zone infrared temperature sensor used is essentially a 16×4 pixel device, but it still beats using a non-contact infrared thermometer with a single point of measurement and IR-Blue does come with a better price than a mid or high-end non-contact infrared thermometer and still offers better results. – Dual mode Bluetooth 2 and 4 wireless connectivity for Android and iPhone iOS devices. – PC, Mac or anything that supports Bluetooth can be used with your custom application. 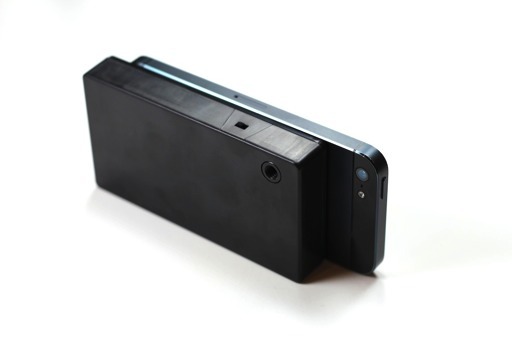 The IR-Blue works with iPhone 4S, 5 and 5s/5c, the iPad 3 and newer or the 5th gen iPod Touch. Apple devices need iOS 6 or higher. Android devices need Android OS 2.3 or newer to be compatible. You can get a fully assembled IR-Blue device for $195 USD from the creator of the device RHworkshop in the US or for €199 EURO from their European partner FIR Sensors. It can be a fun extra accessory for your smartphone that will allow you to start exploring the world of infrared thermography before deciding if you should get a more serious and thus more expensive solution for thermal imaging.